Butter a 20cm shallow flan dish and scatter with 250g raspberries. Sift 55g plain flour with a pinch of salt, add 55g caster sugar and mix. Gradually beat in 3 medium eggs and ½tsp vanilla essence, followed by 150ml milk and 200ml double cream. Pour the mixture over the raspberries and cook in a preheated oven 180°C, gas mark 4 for 45 minutes or until just firm. 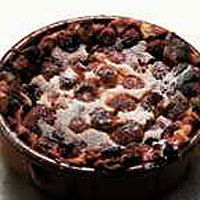 Sprinkle with icing sugar and serve warm.